"From now on, I will obey no laws but me own. I'm gonna create my own gods and devils. I declare war on all mankind." Everett McGill is probably best remembered as Big Ed, proprietor of Big Ed's Gas Farm on David Lynch's series Twin Peaks. Here, he plays Oberlus, a deformed 19th-century English sailor with a skin deformity which makes him look like a human iguana. McGill's rather limited acting range is not unduly hampered by the prosthesis which he wears throughout the film, which went direct-to-video in large part due to the negotiating ineptitude of its producers. Even then, it had an extremely limited release, making this disc a real treasure for Hellman fans. Tormented by his fellow sailors for going native on one of their Caribbean stops, Oberlus jumps ship and winds up on one of the Galapagos Islands. When his shipmates happen to land on the island, he is recaptured and tortured, but escapes again. As a result, he abandons the voodoo gods as well and declares war on all men who set foot on his island. Obligingly, several men do so, including Sebastian (Michael Madsen), Dominique (Joseph Culp, son of Robert Culp) and George (Tim Ryan, son of Robert Ryan). Oberlus immediately shackles and enslaves them, setting up his own little kingdom. Parallel with this story of the outcast Oberlus is the tale of Carmen (Maru Valdivielso), a sexually liberated Spanish woman who is frowned upon by her society. When she ends up on Oberlus' island, he initially takes her as his sexual slave, but the story evolves into a Beauty and the Beast fable. The parallels are deftly drawn, such as the cut after Sebastian calls Oberlus a monster, directly to Carmen's declaration, "I am not a monster." Based in part on a true story, which was picked up by Herman Melville in his collection, The Encantadas (where the name Oberlus was first assigned), this film is a disturbing piece. Feminists are sure to be rankled by the scene in which Carmen is raped and then quite vocally enjoys it by the end. Sebastian at first is rebellious, then grudgingly accepting of his fate, and progresses into active collaboration to the point where he murders a fellow captive who is attempting to signal a passing ship. We are left to ask, what would we do in this situation for what security can be obtained by obeying Oberlus? Tim Ryan gives a good performance as the ship's clerk who teaches Oberlus to read and write. Maru Valdivielso is quite electric throughout the film. McGill's limited range isn't too big a detriment here, because he can adequately project the seething rage of Oberlus, as well as the slight tempering which occurs when he learns he is to become a father. Fabio Testi, as Gamboa, the captain of Oberlus' ship, has a small but rewarding part as he eventually falls into the Iguana's clutches himself. The photography throughout is quite gorgeous, with some stunning scenes of the island at sunset in particular being notable. Brutally nasty, the film is thoroughly misogynistic and misanthropic. We are treated to a bloody decapitation as part of Oberlus' variant on the Prisoner's Dilemma: cut off your friend's head, or I will give the machete to your friend and commute his sentence if he cuts off your head. Oberlus also taunts his captives by leaving unloaded guns within their reach, just to see what they will do. Declaring himself the fount of perfect justice, Oberlus also is happy to remove fingers for petty offenses against him. 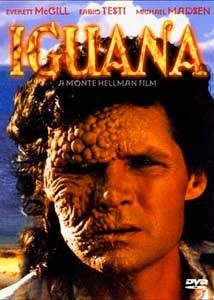 If you're in the mood for a picture that's quite disturbing, Iguana should fit the bill nicely. Image Transfer Review: The anamorphic picture is a little on the soft side, with clarity often lacking. During low light sequences, the picture becomes quite grainy, but this is no doubt a remnant of the low-budget production used here. There are good black levels, and excellent shadow detail is present.. Colors appear to be accurate, though there is frequent use of blue lighting which distorts them at times. The video bit rate tends to be somewhat low, running 3-4 Mbps for much of the film. Audio Transfer Review: The 2.0 Dolby Surround audio track is adequate for this movie. The surround decoding is primarily the sound of waves and surf, lending a very good atmosphere of being on the island. Dialogue is center-oriented, and there is very little directionality to be heard. There is no hiss present, and dialogue comes through quite clearly throughout. Extras Review: The principal extra is a commentary from director Monte Hellman and star Everett McGill. Hellman quite thoroughly dominates the conversation, to the point that one forgets that McGill is there. When he does talk, he seldom has much of interest to say, so at least we know that we wouldn't have missed much if he hadn't been present. Hellman and co-author Gaydos talk at length about what they were trying to accomplish with the film, and also the highly negative reaction from women in general (though folk legend Joni Mitchell did willingly do the theme song). This is the best of the three Hellman commentaries I've heard, and definitely contributes greatly to an understanding of this picture. A few production notes are included in the booklet accompanying the disc, and the extras section contains a bio and filmography of Hellman (identical with that for the Cockfighter disc). In all, a surprisingly good package for a direct-to-video film. An aggressively politically incorrect and highly disturbing film, given a decent transfer and with a very good commentary. Worth a look if that's your cup of tea.